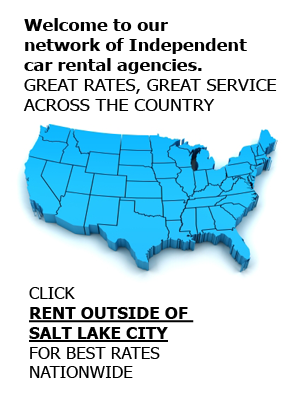 As a family-owned and operated organization, Affordable Rent-A-Car And Sales, located in Salt Lake City, is proud to be one of the area’s most trusted and reliable car rental companies. We offer a variety of rental vehicles and services to best serve our customers during their travels. Whether you need a compact or standard car rental to replace yours after an accident, or an SUV rental to take a ski trip with friends and family, Affordable can help. Submit your online reservation request, or contact us at (801) 266-7368 to speak with us about your rental car needs. Whether you live in the area or are traveling on business, a rental car will suffice nicely to get you to work or a meeting and then back home or to the hotel room again. We provide all types of rentals, from compact models to luxurious sedans and everything in between. You’ll find our car rentals are also affordably and competitively priced. As always, we offer our locally praised customer service to every customer who rents a car from us. Not only will you receive a reliable and incredibly affordable vehicle, but you’ll also leave our office with a smile on your face. We challenge you to find another car rental company to provide you with the same high-quality service that we do. With an emphasis on offering convenience, we here at Affordable have a selection of minivan, cargo van, and 15 passenger van rentals to choose from. Our customers enjoy the convenience of traveling in a van along with the low prices we’re known for. Whether you’re traveling with a large group for a church meeting or wedding party, or you simply need the space, our van rentals make everything easier. Moving offices or apartments? Consider a cargo van rental instead of making numerous trips with your personal vehicle. From the roads leading to your favorite resorts to the natural terrain of campgrounds, the roads around Utah and Wyoming sometimes call for a bit more than a car. That’s why we offer numerous models and sizes of SUV rentals to our customers. We even have ski and snowboard racks that can be added to the top of any SUV rented from us. Enjoy your trip without being limited by a less-than-ideal rental vehicle. Pickup trucks aren’t the stylish go-to vehicle like cars and SUVs, but they serve a purpose: mainly to move large or numerous items. If you’re moving appliances or equipment into Salt Lake City, UT or out of the center and into Park City or another Utah area, we might be your best bet to save money. A pickup truck rental is also going to be the more fuel-efficient option instead of a much larger moving truck. Be sure to take advantage of the convenient Affordable Rent-A-Car And Sales SLC airport car rental delivery and drop-off service when flying into the SLC Airport too. Don’t wait to schedule your vacation into Yellowstone, Jackson Hole, or any other nearby region. Call our rental agents today at (801) 266-7368 to make a vehicle or production rental reservation. If you’re looking to purchase a slightly used vehicle, ask us about our used car sales as well.